Despite the loss against Syracuse, the clear win at Virginia on Saturday has given me good reasons to maintain the Blue Devils at the #1 spot again, sorry Vols!! 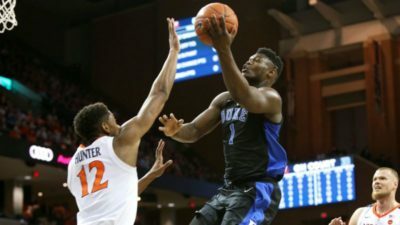 After losing one of their first games by two against an ultra talented Gonzaga team, Duke wasn’t able to survive an overtime thriller, where both Reddish and Jones (during the game) were injured, against Syracuse despite Williamson’s best scoring game with 35pts and RJ Barrett’s versatility (23pts 16rbds 9as but an awful 8/30 from the field). On saturday, the scenario was different as Duke was the outsider at Charlottesville fot one of the most expected game of the season. Without any marquee basent, Duke could count on his Fab Four with 26pts on 6/10 3pt from Barrett, 17pts on 5/8 3pt from Reddish, 18pts 5rbds 5as for Williamson and 13pts and 7as for Jones. That may have been Duke’s toughest game before the Tournament even if the Blue Devils will still be teste against UNC twice. Virginia could not do anything against Zion and his band. Playing at full strength at home, Virginia was surprised from the beginning by Barrett’s barrage from three (5/5 over the first 12 minutes) and wasn’t able to lead even once in the game. That was Virginia’s second loss of the season, both against the same opponent, as Virginia had already lost, this time only by two and at Durham (Tre Jones was still injured). That won’t prevent the Cavaliers from being a contender as they beat ranked Virginia Tech, Florida State and above all UNC yesterday, with a strong performance from De’Andre Hunter with 20pts on 3/3 from three. The Vols may be deserving the second spot but the level of opponents they have played for a month and a half can be deceptive. Since playing Gonzaga on December 9, the Vols haven’t faced any ranked opponents. In their tough albeit underachieving SEC, they won only by three against Alabama and needed Williams’ 43pts outburst to beat Garland-less Vanderbilt. Since January 5, Bowden has scored at least 13pts in seven of his last ten games. We’ll know what the Vols are worth after their two matchups against Kentucky. We didn’t know what to expect of Calipari’s new squad with many freshmen coming in, but they have responded pretty well to the challenge. With ten wins in a row since January 9, including against ranked opponents Auburn, Mississipi State and Kansas. With a little more than 20pts over the last six games, including 11/20 from three and three 10+rbds games, Washington has been the heart and soul of this team. Their next game against LSU and above all the double confrontation against Tennessee could make them leap in the top three and potentially get a number one seed at the end of the season. It’s very tough to rank Gonzaga. After losing consecutive games against Tennessee and North Carolina almost two months ago, the Bulldogs have not and will not face any ranked opponent until the Tournament. Moreover, they have lost returning junior forward Killian Tillie who will not be able to play this year, one less option from outside for Gonzaga. With two losses against unranked Wisconsin and Iowa, the Wolverines have lost the opportunity to stay unbeaten and maybe be at the top of the ranking. Against Wisconsin, Brazdeikis went scoreless with 0/5 from the field while Matthews only scored 5pts in 31min. Against Iowa, Matthews was once again in a bad day with 6pts on 2/12 while X factor Teske was limited to 13min due to foul troubles. Michigan bounced back against now-ranked Wisconsin, limiting them to 52pts with good perfs from Teske (17pts 12rbds 3bl) and Matthews (18pts) despite another bad game from Brazdeikis (2pts on 1/9). Michigan is relying too much on its starting five. If they want to go far, they will need to be good on the same day. After a tough schedule to start the season, the Tar Heels have won all but one of their last twelve games, including wins over ranked Virginia Tech and Louisville. While Little, albeit inconsistent, has been better over the last games (11.6pts and 5.6rbds over the last seven games), White has been on a tear with 27pts 7rbds 6as 4st against Virginia Tech or 33pts 6as on 7/10 from three against Miami. Yet, UNC, which lost Little early in the game due to an ankle injury, could not do anything against Virginia, which limited them to 35% from the field. Like Gonzaga, Nevada’s schedule makes it hard for me to rank them. First of all, they lost by almost thirty against an average team of New Mexico. They took their revenge since then by winning by almost thirty as well with 20pts apiece for Porter and Caleb Martin. Jordan Caroline has been another hot commodity recently with a 40pts 12rbds on 6/8 from three against Colorado State. With only loss against Temple, Houston was one of the last unbeaten teams. Since then, they have kept winning, taking their revenge against the Owls and doing better by beating the other ranked team of the AAC, Cincinnati. In this tough game, The Cougars could count on Jarreau who scored 14 of his 16pts in second half and added 8rbds and 5as after going 14pts and 12rbds against Temple. With its five best scorers listed as guards, Houston may lack the size against bigger opponents. Since their loss at MSU, Purdue has bounced back pretty well with eight wins in a row in the Big Ten including home wins against Indiana and MSU and an important win at Wisconsin. Carsen Edwards (24.6pts per game), albeit inconsistent, is the offensive dynamo of the Boilermakers while 7-3 sophomore center Haarms (7.8pts 5rbds 1.8bl) has had only one game under 66% FG since the loss against the Spartans and recorded 16rbds and 9bl over the last two games.